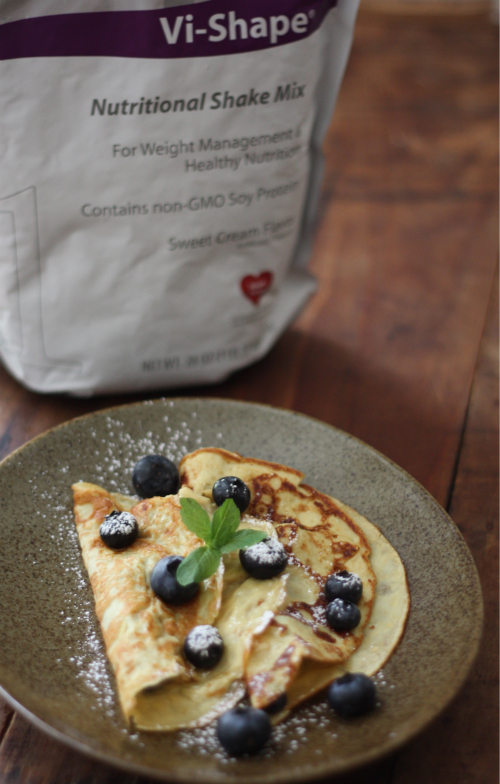 When the folks at ViSalus contacted me and asked if I'd be interested in creating a recipe using their sweet cream flavored nutritional shake mix, I thought it would be a fun challenge and decided to try to make something not traditionally associated with the idea of a nutritional shake — sweet cream blueberry breakfast crepes! 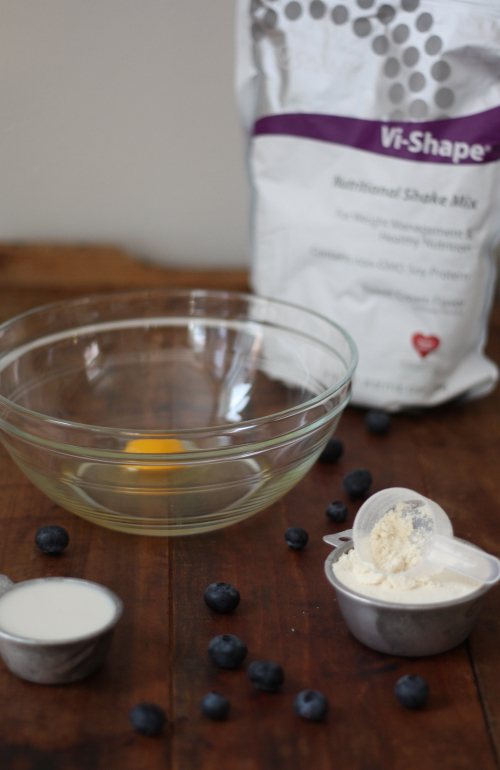 Begin by mixing the egg and the ViSalus nutritional shake mix together. 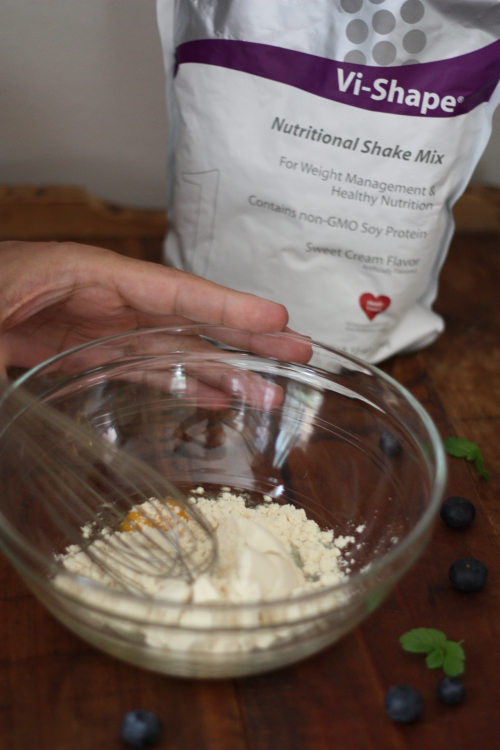 Slowly add the almond milk and water, blending into a thin and smooth batter with a whisk. This will not be thick like a pancake or waffle batter since we're going for that thin crepe consistency. Spray or coat a non stick pan with oil or cooking spray and heat until hot. 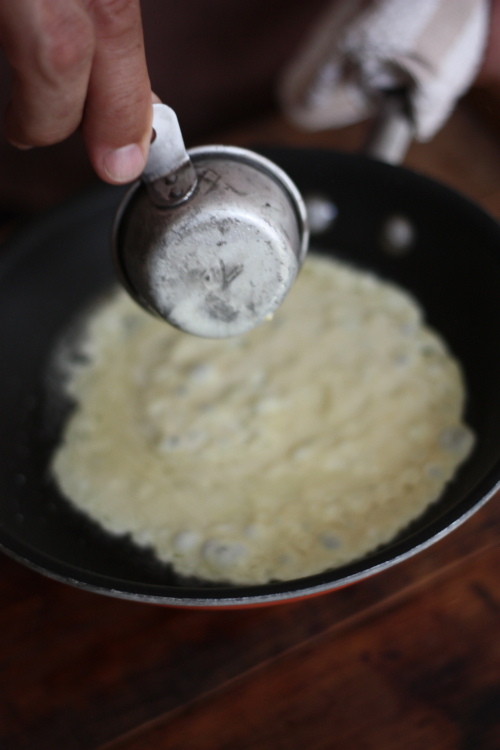 Add 1/4 cup of batter and swirl the pan to make a thin, even coat across the base of the pan and let sit over medium high heat to cook. 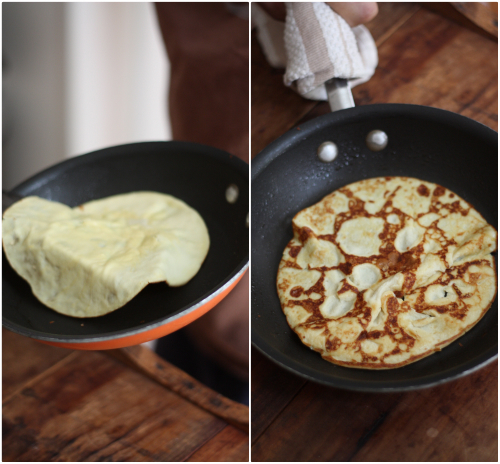 Once the edges and center seem dry and bubbling (2-3 minutes), gently flip your crepe over quickly to cook another minute. 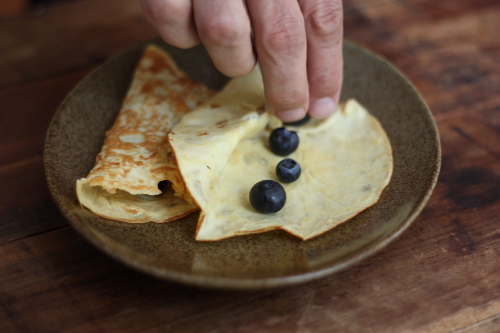 Lay crepes across a plate and stuff with blueberries — feel free to stuff with any additional fruits, spreads or jams of your choosing at this stage. Dust with powdered sugar, or more sweet cream shake mix if you like, garnish with a fresh mint leaf and serve while warm. What are your favorite ways to make ingredient substitutions throughout your go-to recipes? This post is sponsored by ViSalus; the recipe and opinions throughout are entirely my own. 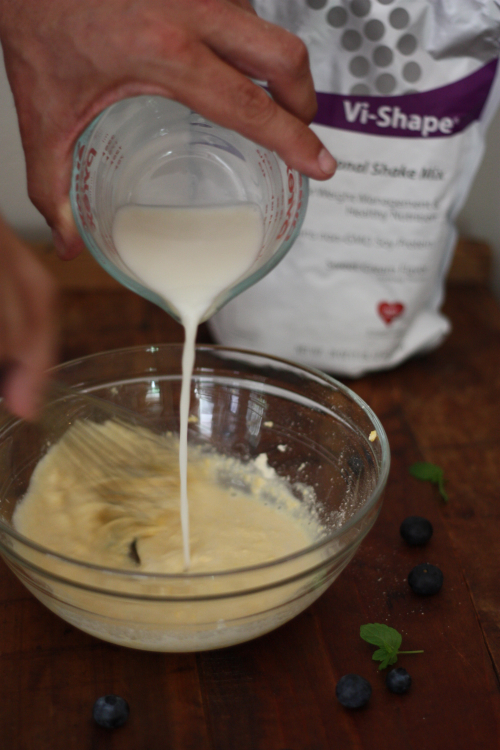 Learn more about ViSalus products, including the shake mix I used in today's crepe recipe here. This recipe blows my mind! I am terrified to substitute things in the recipes I attempt, but I guess that confidence comes with experience. Nah, I just sub and only post if it tastes good! Thank you it was quite yummy and so fresh! I love the garden crepes at I-Hop...I can't wait to sub mushrooms, spinach, peppers and onions for the center. Yum! Looks great! Thanks for checking mine out! If you make this recipe, make sure you have a hot pan and spray it liberally. Great flavor! so how many crepes is one serving? Petrina, I was wondering the same thing...I can't wait to try these! When I tried the first crepe cooked a little to well and when I went to turn it over, it fell apart. 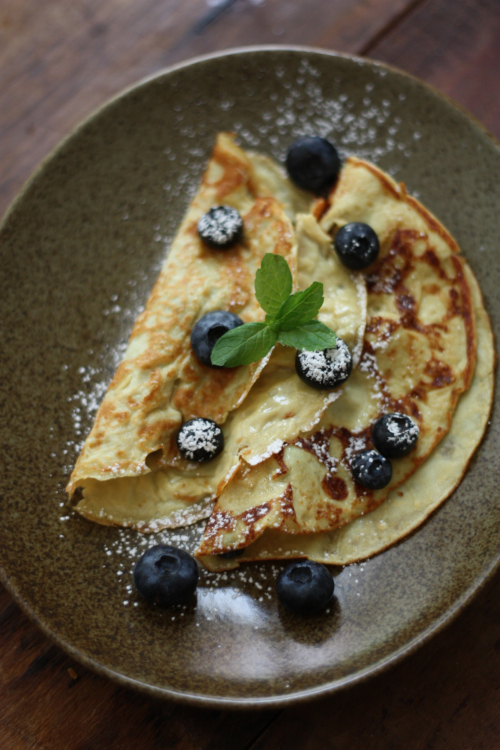 I added just a bit of flour to act as a binder and made several crepes after that...I took my blueberries and sauteed them with a little margarine and cane sugar to make a nice sauce for the inside and to drizzle over...Very good Recipe!!! After months of being terrified to make this. It was delish!! So happy you tried it!